HTC already hold a strong position in the high-end virtual reality market with the Vive, but the company is apparently planning to release a mobile VR solution too. Talking to CNET at an HTC U series launch event in Singapore, the company’s president of smartphones and connected devices business Chia-Lin Chang said that the mobile headset will work with its new flagship smartphone the HTC U Ultra. If it’s not as simple as headsets like Samsung’s Gear, but it’s not quite on the level of high-end devices like the Vive, it’ll be interesting to see how HTC’s solution straddles the line between the two. An easy-to-imagine solution would be a headset that’s powered by HTC’s high-end smartphone but doesn’t rely on it as a display. 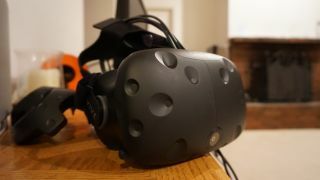 Considering one of the biggest problems facing high-end VR headsets is their restrictive tethering, a reasonably powerful mobile solution would be an ideal product for HTC to release. Not only would it offer higher quality VR experiences at lower prices, it could also provide a significant boost to HTC’s phone sales. We won’t have long to wait to see what HTC has planned, either, as Chang said that the mysterious headset would be launched by the end of the year. Perhaps at this year’s Mobile World Congress, HTC will be more forthcoming with the plans for mobile VR and we’ll get a better idea. Update: An earlier version of this article misidentified Chia-Lin Chang as HTC's CFO. He is HTC's president of smartphones and connected devices. The article now reflects the proper job title.